Glass bottle filled with real, aromatic natural frankincense resin. Size: 1 (2.5cm) long with 30 (76cm) black satin necklace. Made by paw (Handmade) in USA. 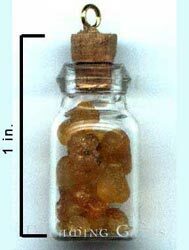 More Information: Bottle necklace is filled with aromatic frankincense resin, a sweet-smelling golden substance. Size: 1in. (2.5cm) long glass bottle with cork, on an adjustable, black twisted nylon cord ~30in. (76cm) long. Cork is tight, but can be removed very carefully. It can also be secured with glue for permanent hold. Related Products: Jewelry, Frankincense, Resin, Bottle. This product first appeared in our catalog on Sunday 20 August, 2006.